At APT, over the last few years we have had more and more customers wanting to bring their manufacturing operations back to the UK. It’s no longer the case that overseas means cheaper. Manufacturers are now finding it more cost effective and reliable to find subcontractors closer to home. Re-shoring to the UK makes a great deal of sense. Outsourcing or subcontracting in the past have made companies nervous. Overseas manufacturing may have been cheaper, but there were issues with quality, shipping costs, language barriers and lead times. But there is a solution. 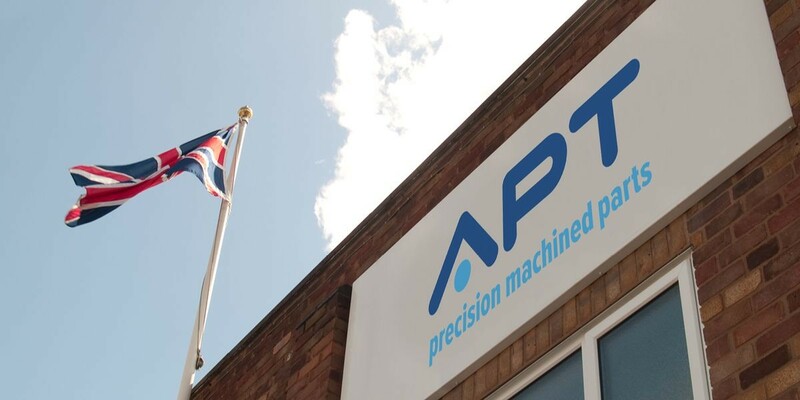 We explain the benefits of subcontracting to a respected, expert, British manufacturer like APT. APT have over 60 years’ experience designing and manufacturing precision parts and supply satisfied customers worldwide, day in, day out. British subcontractors have never been more attractive to firms – competitive pricing, quality manufacturing and reduced shipping costs are among the many benefits. In general, choosing to outsource to a respected manufacturer can help you save on site space, operational costs, overheads, taxes, utilities, security and insurance. With APT, you will also have fewer regulations to manage in-house. We are ISO 9001 and AS 9100 accredited. These both require meeting stringent criteria. By subcontracting to us, this removes the costs, employee time and general hassle of adhering to them yourselves. At APT, we offer full traceability of our production, from raw material sourcing to the final delivery to our customers. This gives you complete peace of mind and the confidence in the quality of our products. Our relationships with our customers are partnerships. We have consistently invested in state-of-the-art technologies and the knowledge of every member of our team. You can benefit from our extensive design knowledge to help you refine your products, as well as profit from our experience in CAD modelling, precision turned parts and CNC milling. We operate on a 24/7 basis. This leaves you to redirect your resources and staff into your company’s core operations. By partnering with APT, you can reduce operating and overhead costs. By saving through outsourcing, you can offer lower prices while increasing your profit margins. You’ll have more money to spend on marketing, debt reduction, research and development, salaries and other areas that can help improve your bottom line. Based in the heart of the UK, APT can offer a quick turnaround, shorter lead times and fast, efficient delivery. We also offer a blanket order service, enabling you to keep costs down by ordering over a 12 month period, while optimising your own storage space with deliveries only as and when components are required. At APT, we can offer cost-effective, quality solutions for all your subcontracting and outsourcing needs and we are here, in the UK. We’ll be visiting Subcon held at the NEC, Birmingham 5-7 June 2018. If you are attending, let’s meet up for a chat. Call Nick Baller on 0116 287 0051 to arrange a time. Even if you can’t make it at Subcon, if you have any questions, don’t hesitate to contact us.